Hively Hideaway - Absolutely darling! A perfect small family getaway within walking distance from town! Romantic and cozy - a perfect retreat. Enter from the nice large front deck into the living room that has open ceilings with log beams, a beautiful stone fireplace and comfortable seating. Immediately adjacent is a small dining table and next to that is the simple yet fully functional kitchen. Going through the living room to the right is the master bedroom with a queen sized bed and next to that is a full bathroom with shower only. Head upstairs (stairs are steep) to a loft with two comfy twin beds! 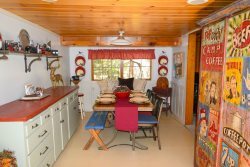 If you go through the kitchen to the enclosed back porch you'll see a nice laundry area with access to the rear part of the deck and the last bedroom which is also accessible from the front deck. This last bedroom has a single. This home is darling and has lots of appeal! Walking distance to town and the lake with flat parking for 3 cars. **Now with WiFi! ** We must have 24 hour notice prior to your arrival. After hours number is 209-770-1624.